My least favorite part of the day is dinner time. There was a time when I loved to cook, but lately it has become a chore that I would gladly hand off to anyone willing to do it for me. I’ve tried many times to set and stick to a schedule and plan in advance, but I’ve never really mastered it. 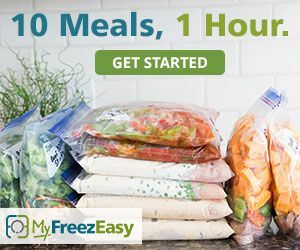 I’ve been trying out the MyFreezEasy.com Freezer Meal Plan Membership from MyFreezEasy. It has made it possible for us to have home cooked meals with our crazy schedule (and my lack of organization). MyFreezEasy was designed to make the whole process – from planning to getting food on the table – as easy as possible. I began by logging on to their website and watching the tutorials on how to use their system, including the new web app that allows you to create a custom plan to suit your family. I haven’t tried freezer cooking before, so I took my time learning the ropes before deciding on a menu. Since I have a house full of picky eaters, and two vegetarians, a custom plan was the only way to go. There are pre-set plans that you could easily choose, print and head out the door with your shopping list in five minutes. To put together our menu, I browsed through all the options and chose a few vegetarian meals and a couple of meat based meals. I was then ready to print out my shopping list, recipes and freezing instructions. It only took me about ten minutes to create my custom plan using the desktop app. This could be accomplished even faster if you are quick to make a decision or have flexible eaters! My print out included instructions and recipes for assembling 10 meals (2 of each of the meals I selected), plus a shopping list by both meal and grocery store section. It was the easiest plan ever. Even at three hours, it was totally and completely worth the effort. I had ten days of easy, easy delicious dinners. I always had a meal on hand, ready to go, and a bunch more in the freezer. The meals were tasty, and I plan on making most of them again. 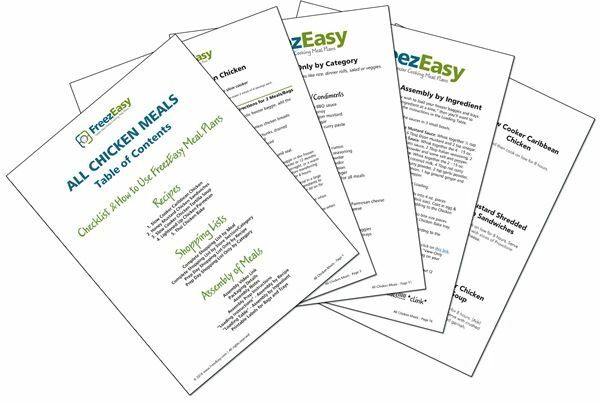 A MyFreezEasy premium membership will give you access to all of the monthly menus, the desktop app, a side dish cookbook and video tutorials that walk you through the process of freezer cooking. I absolutely recommend this if you struggle with the daily stress of feeding your family. It has saved me tons of time and stress, because I can quickly get dinner on the table at the end of a busy day. I will gladly sacrifice a weekend morning to fill my freezer with these meals! You can learn more by following MyFreezEasy on social media.